Aidan O’Brien may be finding the going tough across the water in York, but it’s business as usual on the home front with his Ballydoyle team landing the Listed Racing Post Vincent O’Brien Ruby Stakes in fine style with I Can Fly at Killarney yesterday. The 2/1 favourite outclassed her six rivals to run out a comfortable winner of the €50,000 contest to build on the promise which she had shown when a staying-on fourth behind Dermot Weld’s Yulong Gold Fairy in a Listed contest at the Galway Festival. 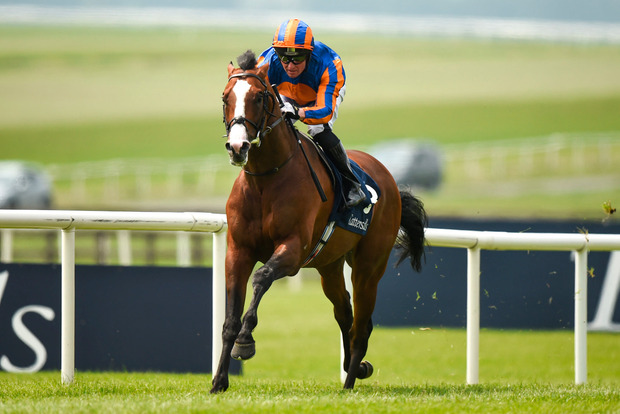 Having contested the English 1,000 Guineas and Epsom Oaks earlier this season, this was a massive drop in grade and she made her class tell with winning jockey Seamie Heffernan revealing the high regard in which he holds the daughter of Fastnet Rock following her victory. “I rated her very highly and she disappointed twice. She came out of the Oaks a little worse than we expected and there were a few of them coming out of the race worse than we expected,” Heffernan said. “The season doesn’t wait for anyone and if we keep running them the odd one will win and get placed but I don’t think they’re fully firing. She has outclassed them today but is a hell of a lot better. The second day of the Killarney Festival is headline by the KWD Kingdom Gold Cup Handicap (5.30) where champion jumps trainer Willie Mullins holds several aces switching to the level. The Closutton handler saddles Law Girl, which stayed on well to score at Gowran Park last week and will enjoy the step up in trip in the hands of champion Flat jockey Colin Keane. As is often the case, trying to find the right Mullins horse is no easy task with Meri Devie (Rachael Blackmore), Exchange Rate (Ronan Whelan) and Gustavus Vassa (Danny Mullins) all respected, but it may pay to side with John Joseph Murphy’s Emperor Waltz. Undefeated at the Kerry track in his three runs there, Emperor Waltz is still an improving sort and there may be more to come from Declan McDonogh’s mount.